This morning Joe, Jess, Caroline, Meghan, Dan, Chris and I came back to Auckland to see the Dalai Lama speak. We were all very excited to hear his talk about ‘The Path to Happiness’ so we took an early ferry home and then all went for breakfast together. At 11:45 we all reconvened and walked to the Civic Theater together to claim our tickets from the Box Office. I was very shocked to see all of the protesters outside of the theater yelling in anger that the Dalai Lama is responsible for all of damage that was done to Tibet during his time of political rule. We escaped the chaos and went inside the theater to find our seats. The inside of the theater was absolutely beautiful and with each step up the overcrowded stairs my body filled with excitement. 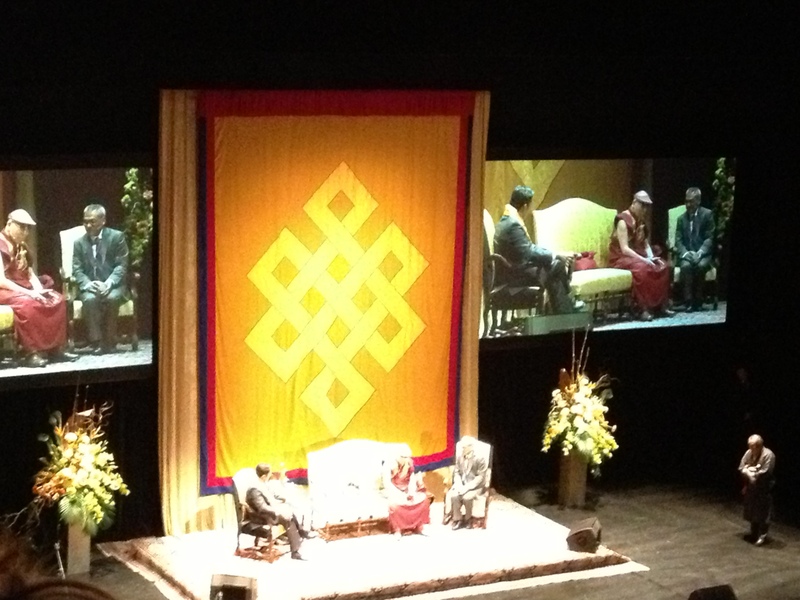 His Holiness only spoke for 40 minutes and he touched upon the importance of being compassionate and affectionate. He said that being happy is a natural right and that happy families bring up happy children and that is how we can spread happiness and peace in the world. He said that we must all pave our own path to happiness and must be considerate of others when we make decisions. I enjoyed his talk greatly although I was hoping to get more of an insight into Buddhism and his daily life as the “simple monk” he considers himself to be. It was a very different experience being able to hear and see the Dalai Lama in New Zealand and this is just another thing I can check off my bucket list! What an experience, thank-you for sharing! Happy families raise happy children. Happiness is a right! I would love to have been there!!! Such beautiful words. I just had the good fortune to encounter him in Dharamsala last week 🙂 by a series of coincidences we ended up getting his blessings as well! Thank you for sharing this..